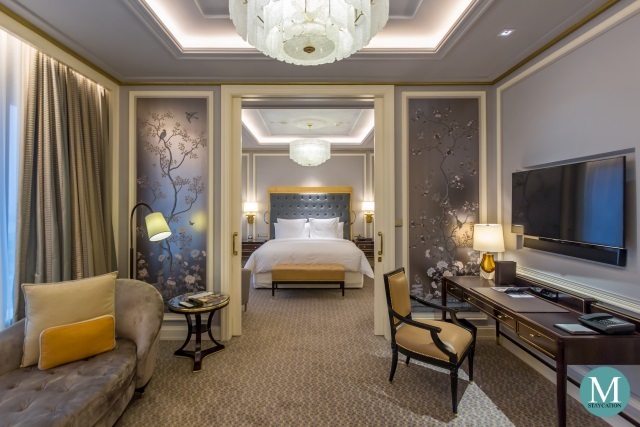 If you are planning for your next staycation in Metro Manila and you are looking for a hotel with rich history, place identity and character, then you should consider The Henry Hotel Manila. 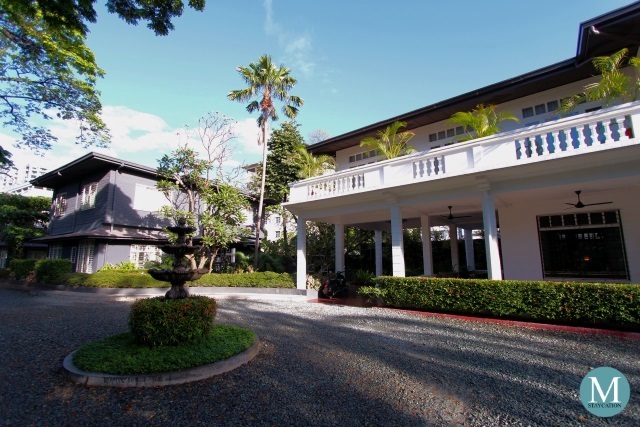 The property was originally built in 1948 as a residential complex consisting of individual houses in an architecture typical of post-liberation Manila era. In partnership with the owners, The Henry Hotel redeveloped and repurposed the property into a 34-room boutique hotel through adaptive reuse. 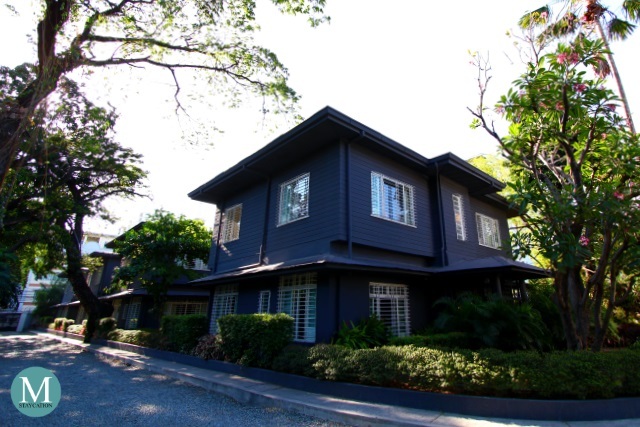 Opened in late 2014, The Henry Hotel Manila consists of five houses, with the main house where the front office is located, and four identical houses which have been partitioned into individual guest rooms and suites (check room rates). 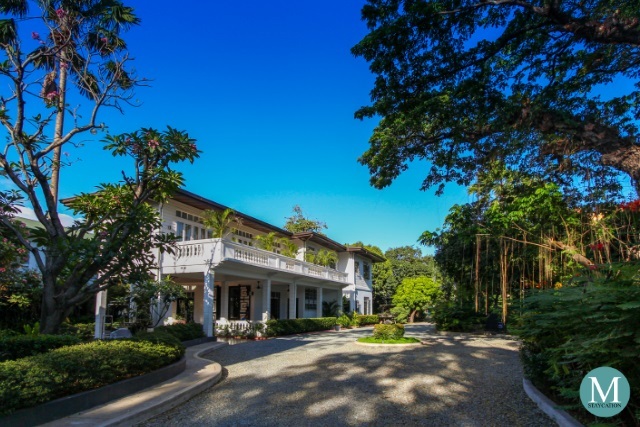 As you enter the property and drive through the gravel driveway, you will immediately feel transported back in time in the mid-20th century. 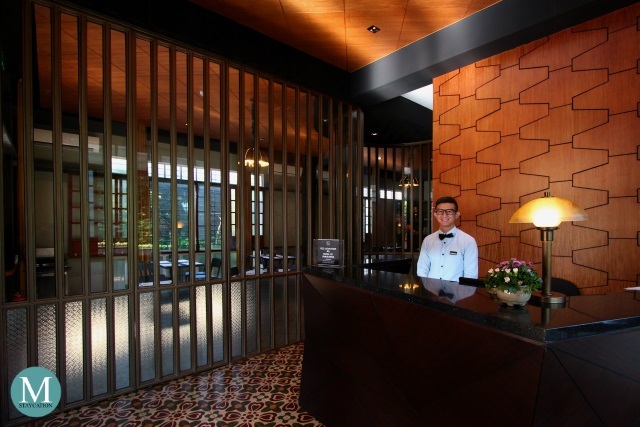 Entering the front office, you will be greeted by the warm colors of the wood and tiles which are as warm as the Filipino hospitality of the hotel's guest relations staff. The check-in process was quick and efficient. After filling-out the guest registration form, the front office staff issued us our electronic key cards and walked us to our suite. 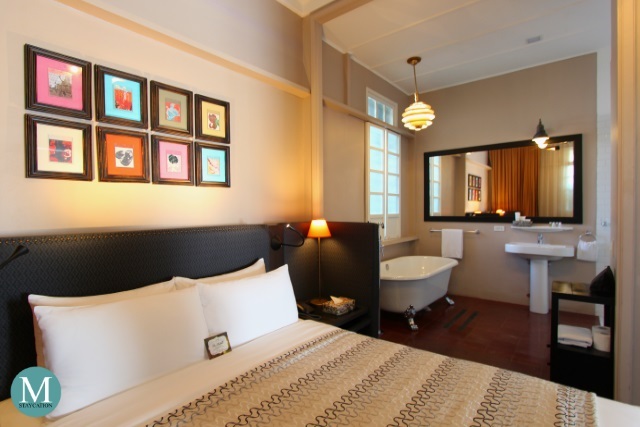 The Henry Hotel Manila has three room categories: the Classic Room (27 sqm), the Suite (54 sqm) and the Owner's Suite (84 sqm). 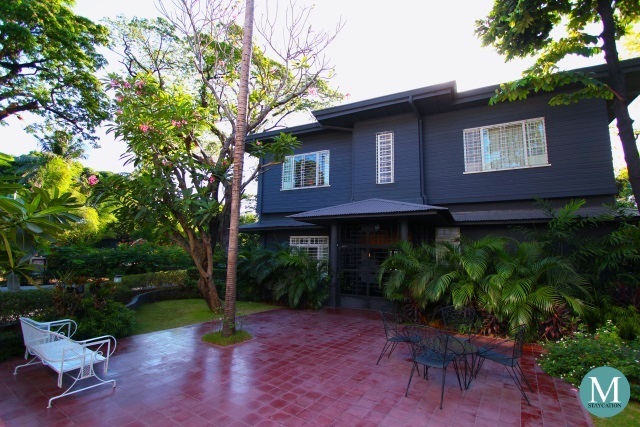 The Owner's Suite is located on the second floor of the main house, while the Classic Rooms and the Suites are distributed in the four identical houses (check room availability). 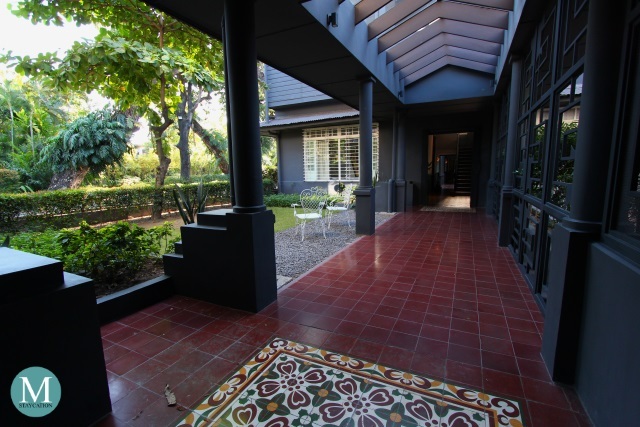 Walking through the long corridor that connects the four identical houses, you would easily notice the decorative tiles that cover the floor. Those are actually the original tiles that have been beautifully preserved, cleaned, polished and brought to their former glory. 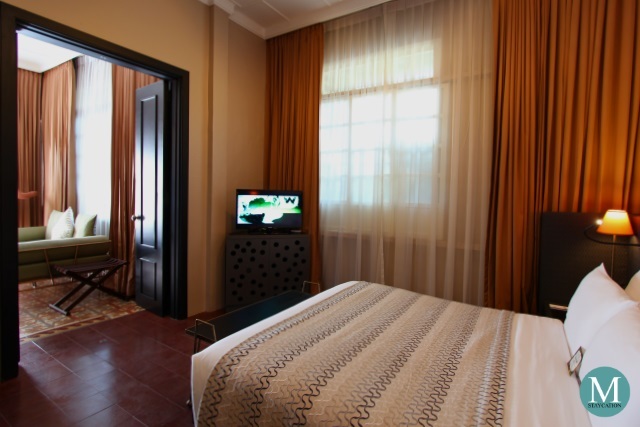 We stayed in a Suite during a weekend staycation at The Henry Hotel Manila (check room rates). The room was already pre-cooled when we entered. As we stepped into our suite, we had that weird feeling of visiting an ancestral house of a distant relative. We had instant emotional connection with the room, an experience that is unique to this property. 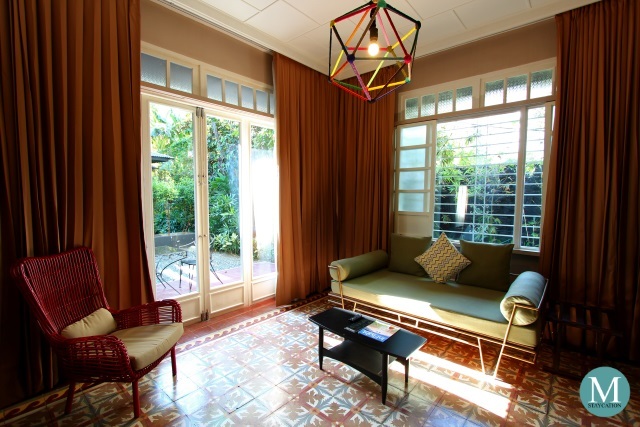 The living area of the Suite has that typical post-liberation style of the 40s and 50s where the floors are covered with tiles, the high ceilings with grid-molded pattern, a lot of natural light comes in through the wide windows, sliding window panels and window grilles that are common in Filipino homes at that time. 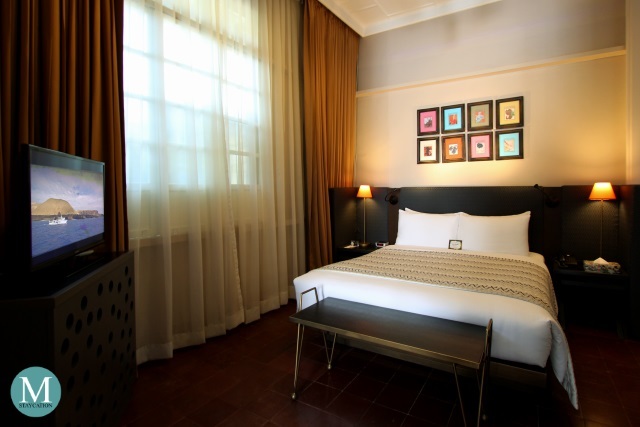 The Henry Hotel Manila has a total of four Suites, each located on the ground floor of every house. The Suite features a separate living area and bedroom. Each Suite also has its own terrace with a small courtyard matched with wrought iron table and chairs. The interior of the Suite combines elements of vintage design with touches of art and contemporary furniture and accent pieces. 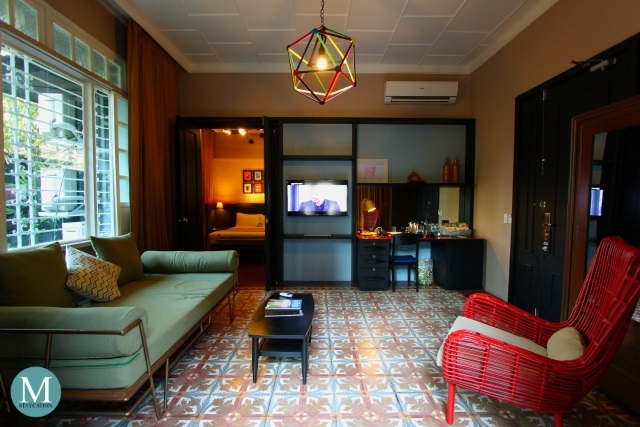 If you will look closely, the original tiles are matched with the olive color of the day bed and the striking red lounge chair. The LCD TV and the wall mounted air conditioner beautifully blends into the space without destroying the overall modern vintage feel of the room. The Suite measures 54 sqm but it actually feels more spacious than that. The bedroom alone has so much floorspace to move around. 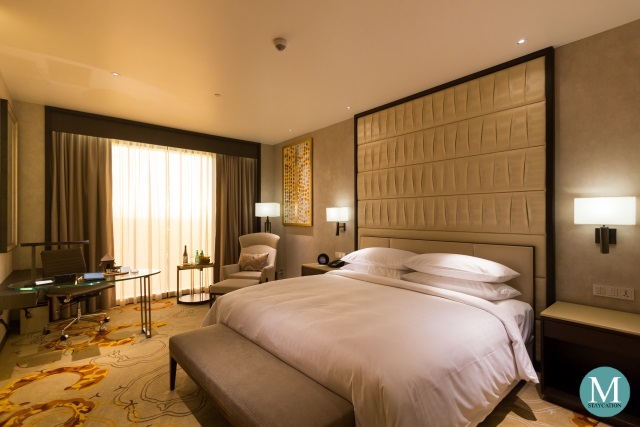 I particularly loved the upholstered headboard which gives the bedroom a touch of elegance. The bedside lamps had orange shades adding a tint of sepia into the space that further enhances the vintage feel of the room. Matching the overall theme of the bedroom is the steel-frame furniture with lines echoed to the wave patters of the bed runner. Complimentary WiFi Internet access is available inside the whole Suite. To complete the whole Henry Hotel Manila staycation experience, we played 1940s music tracks from Spotify through our portable bluetooth speakers, further evoking the place identity of the property. 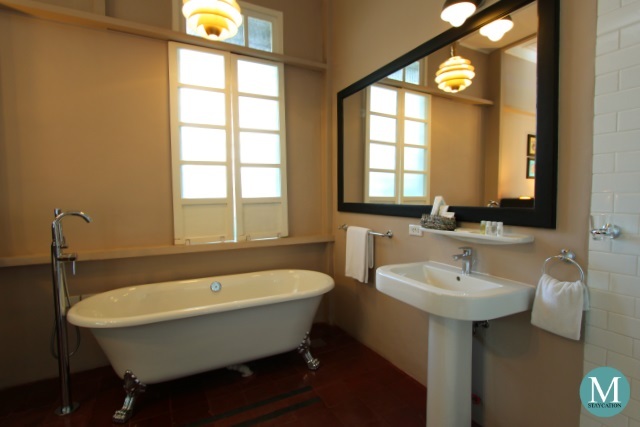 Connected to the bedroom is the en suite bathroom which is highlighted by the stand-alone tub atop lion's paw feet, a feature you would't see in luxury hotels in Manila. 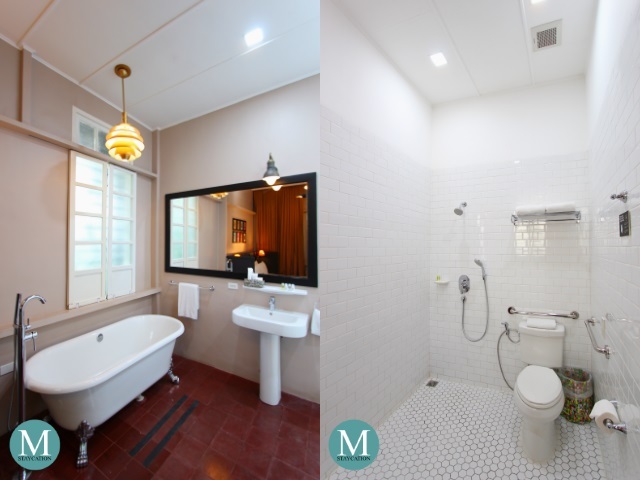 The shower area is designed in a style typical of the early 20th century using white subway tiles on the walls and white hexagonal tiles on the floor. 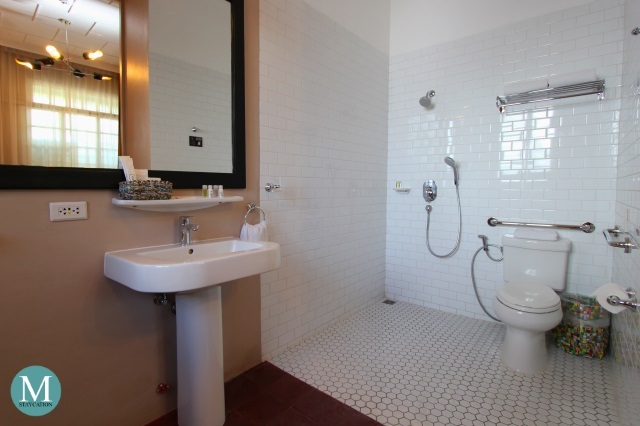 Being a hotel, the bathroom is equipped with modern bath amenities to suit the lifestyle of today's generation. 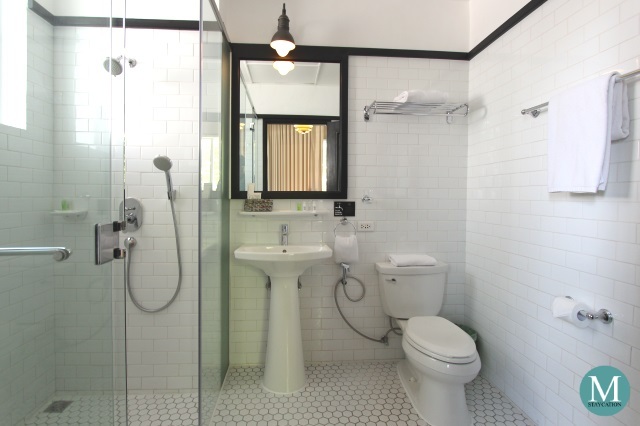 Features such as hot & cold shower, hand and rain shower are just some of the modern conveniences available to checked-in guests. In addition to clean and high quality cotton towels, guests are also provided with The Henry Hotel branded toiletries including shampoo, body soap, body wash, body lotion and dental kits. Staying in a Suite felt like having your own house within a house, the Classic room on the other hand felt like your own room in a bigger house (check room rates). Available in twin and king size bed configuration, the Classic rooms on the second floor of each house enjoy more natural light streaming in from the outside. The flooring is made of the original hardwood which has been repolished to give it a glossy finish. Adding warmth into the room are the red bed runner and the bedside lamps with orange shades. 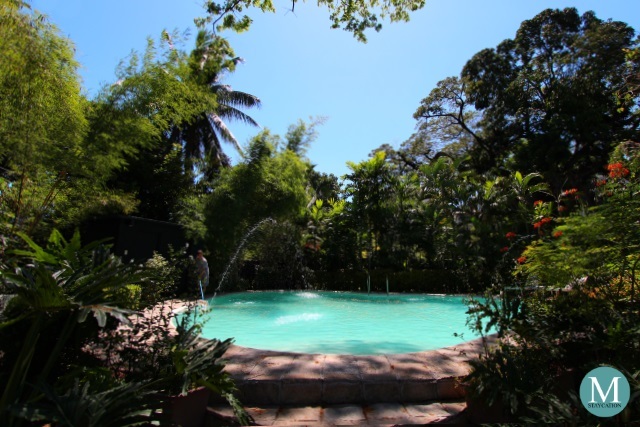 Afternoons are best spent by the poolside, under the shades of the century old trees while enjoying a good read or a relaxing dip in the pool. 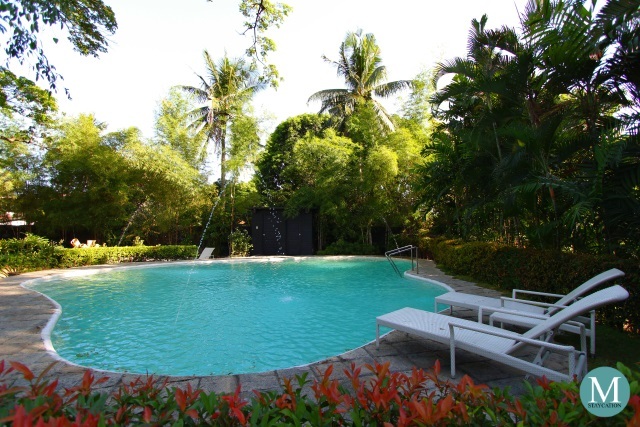 With the sound of the chirping tree birds and the calming sound of the pool's fountain, let the serene landscape of the garden drift you further back in time when Manila was free of all the noises and stresses of modern times. 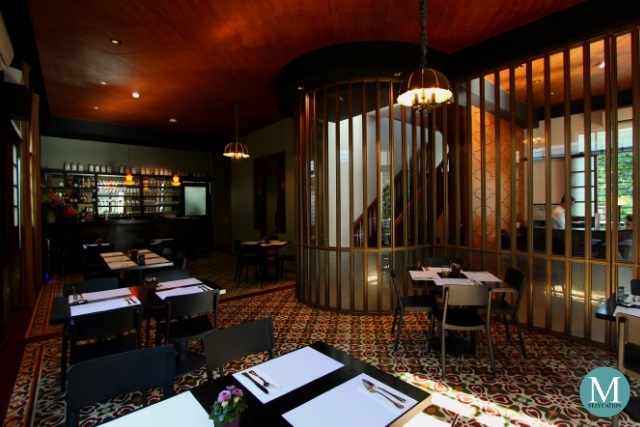 And then there is Apartment 1B restaurant which occupies the space of what used to be the dining area of the main house. Consistent with the modern vintage feel of the whole property, the restaurant used a lot of dark wood, brasswork and frosted glass panels. 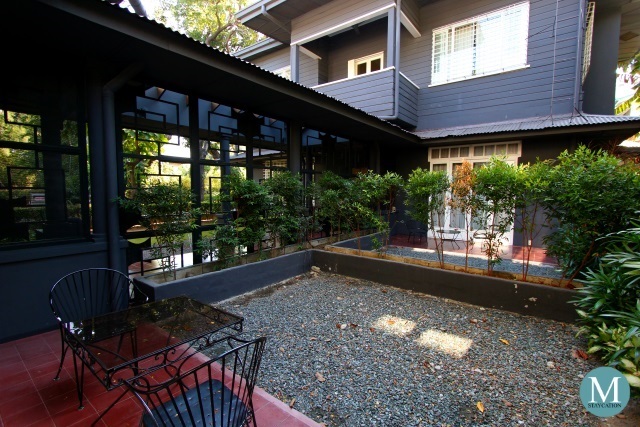 Appartment 1B offers international and local gourmet dishes in a casual dining setting. The restaurant also offers great coffee-based beverages as well as cakes and pastries. 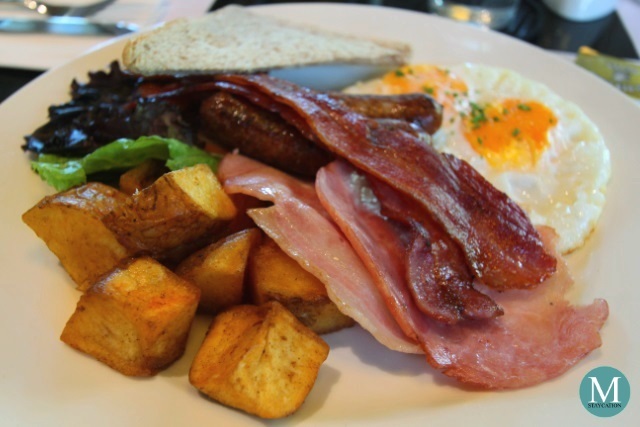 Checked-in guests also enjoy their complimentary continental breakfast at the restaurant. 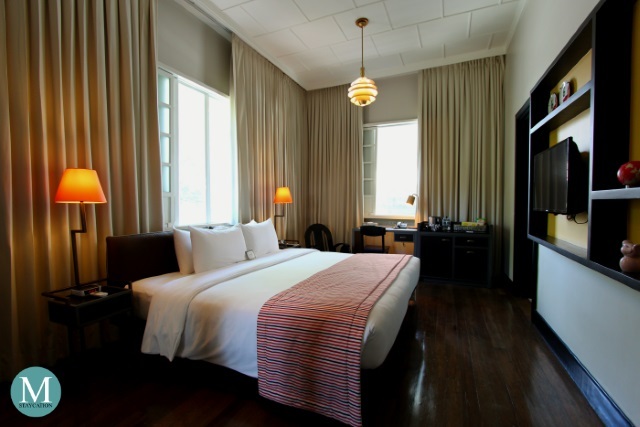 The Henry Hotel Manila certainly is a hotel like no other. It is a hotel with a character. It is full of history which the present generation can easily connect with. 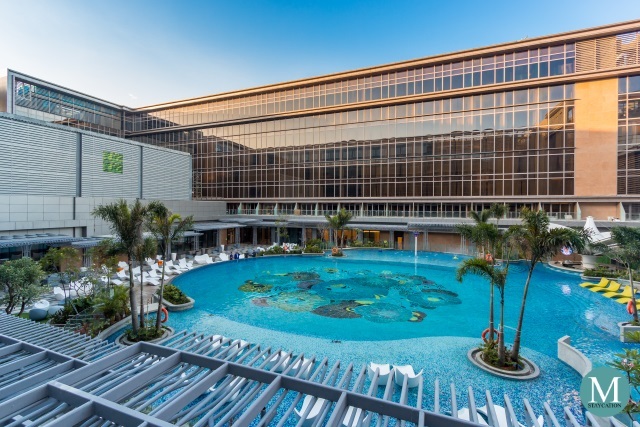 It moves away from simply pampering its guests with well-appointed rooms and excellent service, to creating a unique emotional connection and unforgettable memories to its guests.